During normal circumstances the left ventricle is many times larger than the right ventricles, which is why the QRS complex is dominated completely by left ventricular vectors. 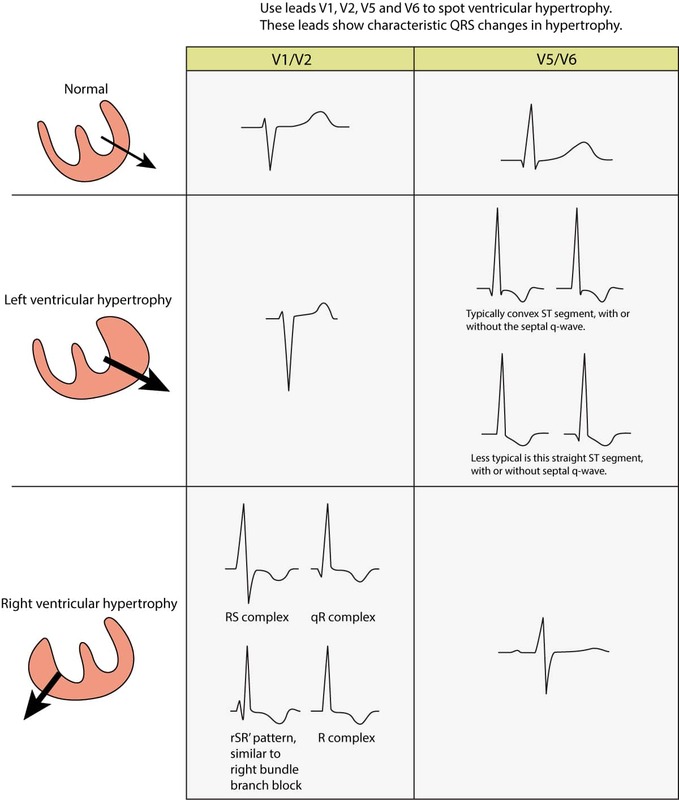 Hence, right ventricular hypertrophy must be pronounced in order to come to expresson the ECG. 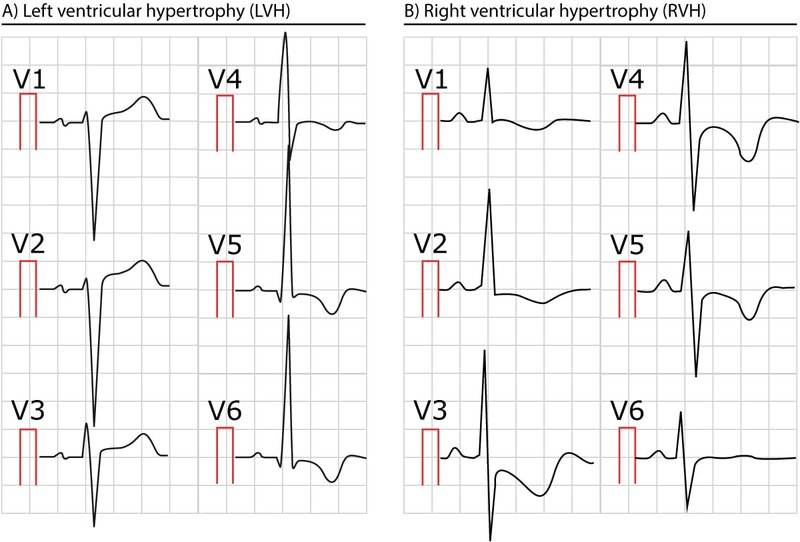 Moderate right ventricular hypertrophy may not alter the ECG significantly. 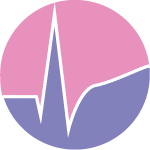 The ECG is particularly helpful in RVH because echocardiography is less sensitive with respect to RVH, because the right ventricle is difficult to visualize clearly with trans thoracic echocardiography. Lung disease, congenital heart disease (transposition of the great arteries, pulmonary valve stenosis, atrial septal defect, ventricular septal defect), tricuspid valve regurgitation are the most common causes. V1 and V2 shows larger R-waves and smaller S-waves. The R-wave may be larger than the S-wave. 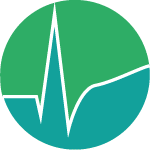 R-wave peak time is typically prolonged (35 to 55 milliseconds) in V1–V2. Hence, the QRS duration is slightly prolonged (but it does not reach 120 milliseconds, unless there is concomitant bundle branch block). rSR’ pattern is occasionally seen in V1–V2. This resembles, but is not, right bundle branch block (RBBB). Secondary ST-T changes are common in V1–V3. The ST-T segment is usually discordant to the QRS complex. V5, V6, I and aVL displays smaller R-waves than normal. 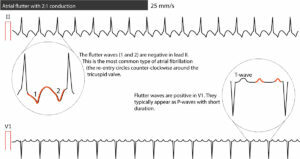 Along with larger R-waves in right sided leads, the R-wave progression may be opposite. The electrical axis is virtually always shifted to the right. Right axis deviation is almost mandatory. 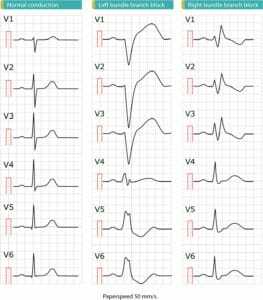 S-waves are occasionally seen in leads I, II and III (SISIISIII pattern). P pulmonale is very common.